There he was, all alone on Lindbrook Drive in front of Jamba Juice at 12:25 p.m. today, the mayor in the shade on a cell phone while a security detail stood sentry in the sunlight (blame Hizzhonor's choice of the shade for the grainy quality of the cell-cam image, which would have been more clear had he stood in the sun). 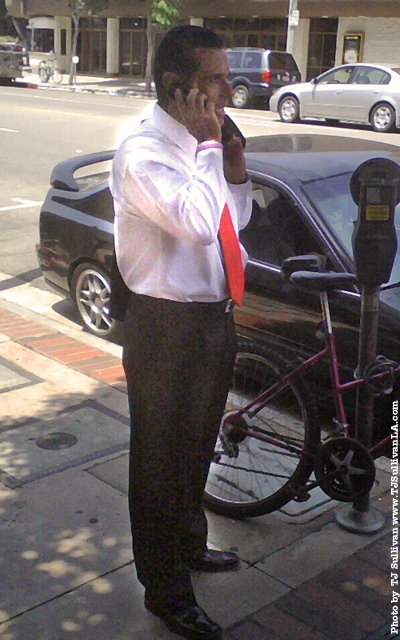 Nontheless, the Mayor was seemingly unfazed by the heat, his shirt so nicely pressed and perfectly white. He's clearly a man who's got that pesky ring thing under control, I mean, the ring-around-the-collar thing. At least one young woman asked to have her picture taken while standing beside the mayor, who kindly displayed his pearly whites for the impromptu portrait. 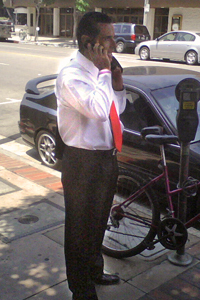 No news to report, other than, well, how often does anyone see the mayor of Los Angeles in Westwood Village? I'm there every day, so I can tell you for certain that he's not. Caption suggestions welcome. Click the "Email" tag at the top of this post. If any submissions inspire a grin or better (and aren't patently lunatic, profane or potentially libelous) I'll post them in an update online a few days from now. All caption submissions will be credited to anonymous readers, unless, of course, I know you and can therefore verify your identity. This will help me avoid falling prey to such trickery as, say, those pranksters who might claim to be a famous someone's estranged spouse.